Kandeyce Jorden was born in Berlin, Germany and grew up riding horses in Northern California. She moved to LA to pursue an acting career and landed the lead role in Miguel Arteta's Star Maps, which earned critical acclaim at the Sundance Film festival. She continued in act in several more films and commercials before turning to directing. Her short film Undone traveled to film festivals around the world and won awards at Nodance 2001. She directed a short film for Skyy Vodka called Layover. Girl is a feature documentary, labor of love project, ten years in the making. Originally the film was a profile piece about the top female DJ's in the industry. It took a turn when Kandeyce met DJ Sandra Collins…becoming a filmmaker's journey into a life she could never live. Kandeyce has also written a feature length screenplay called Dominque, a futuristic tale about the first woman to be cloned, which she plans to direct next year. In addition to her film work, Kandeyce is a prolific painter and mixed media artist. Recently having her first two solo exhibits in Venice. "My paintings inspire my films, and my films inspire my art. I couldn't do one with out the other". Originally from Mexico City, Alejandro has been working in the entertainment industry for over 15 years. He landed his first post -production jobs in the editing rooms of films such as Vertical Limit, Road to Perdition and Moulin Rouge. He then transitioned to editing and producing documentaries. His work in the non-fiction world has dealt with issues ranging from the lives of Latin American maids in Los Angeles (Maid in America) to the transformation of a New York writer into a Catholic anarchist who at the height of the Depression unwittingly created what would become a worldwide peace and social justice movement (Dorothy Day: don't cal me a Saint). Killing the Messenger, a documentary on the need to protect journalists and free speech, is his latest project. 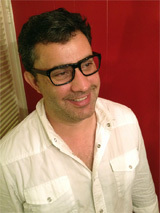 Alejandro's work has been shown on PBS, the Tribeca Film Festival and various international venues. He has also edited promos, webisodes and DVD content for a number of feature films.